With summer just around the corner, it’s time to look for luxury vacation rentals in Skaneateles where you and your family can enjoy upscale relaxation in a jewel-like setting. 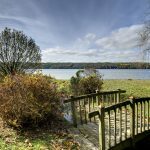 At Finger Lakes Luxury Rentals, we’re proud to announce our latest getaway property – a private, lakefront estate on beautiful Owasco Lake. This lovely estate is sure to become one of our most sought-after properties, so now is the time to book your vacation. 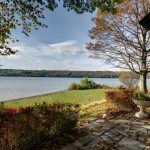 This Owasco Lake home is the newest and most luxurious of our Skaneateles vacation rentals, with a beautiful setting combined with plenty of extras to make your stay comfortable. This two-story, Tudor style home is constructed of mellowed stone with wood accents in a soft shade of green for a tradition look and feel nestled on a spacious lot complete with mature trees and shrubs. You’ll feel like you’ve stepped back in time when you relax on your private stretch of level, lakefront property or fish off the dock. Or stroll your oversized yard and picnic under one of the many trees that have grown here for years. There is even a gurgling creek running across one corner the property and surmounted by a charming, arched foot bridge. The traditional beauty of this home continues indoors, where you’ll discover stone fireplaces, a soaring ceiling and exposed beams in keeping with the Tudor style. There are fireplaces in the main living room, the master bedroom and the billiards room so you can enjoy a crackling fire on cooler evenings. The billiards room provides the perfect entertainment on those rare rainy days in Skaneateles. We always make sure your guests have the most modern amenities when they rent one of our luxury vacation rentals in the Finger Lakes. Our newest property is no exception, offering modern conveniences to complement the traditional beauty of our newest offering on Owasco Lake. To ensure your comfort at every point in your stay, we’ve renovated our newest property to make sure you’re not only comfortable, but positively pampered. Washer, dryer, dishwasher, air conditioning and a grill are just a few of the thoughtful features. Two en suite bathrooms, two guest bathrooms and a half-bath on the first floor ensure your privacy and every opportunity to soak away your cares or take a long, hot shower at the end of a busy day. You’ll enjoy stunning vistas in every direction while relaxing outside on the fishing dock, sipping a drink on the private beach or strolling the level, green landscaping. If you’re looking for some outdoor activities, we thoughtfully provide our guests with four kayaks, two paddleboards and even a mooring buoy. Paddle on Owasco Lake, splash in the shallows along the shore or simply lounge under a shade tree. No matter what, you’ll be surrounded by natural beauty. There are plenty of activities for the whole family when in the Finger Lakes, including shopping, kayaking, the wine trail, spas, golfing and fishing chargers. When you return after a full day of fun to this gorgeous Tudor home each evening, you’ll understand why we’re so proud of our newest addition to our lineup of luxury vacation rentals in the Finger Lakes. Have the winter blues? Tired of being cooped up in the house and ready for a break? Plan a cozy winter vacation in Skaneateles, where there is lots to do year-round. Hibernating inside is fine, but taking advantage of the winter beauty of Skaneateles is much better when you’re staying in one of our Skaneateles luxury vacation rentals. The Finger Lakes region offers so much to do during even the coldest months of the year. The Finger Lakes are famous for their wine trails. The unique climate and rich soil combine to produce a variety of award-winning wines. Plan a getaway weekend and you can visit some of the best wineries in the region, including the beautiful Anyela’s Vineyard located in Skaneateles. There are lots of places to stay in the Finger Lakes that are within walking or driving distance of local wineries where you can warm yourself from the inside out with fine wines served in beautiful surroundings. Dining options from fine cuisine to casual burgers abound in the Finger Lakes. You can choose from dozens of restaurants as well as wineries and breweries offering their own menus of delicious foods. Farm-to-table options offer the freshest local dishes along with exceptional views of the surrounding lakes and countryside robed in winter beauty. Greek Peak Mountain Resort offers exceptional skiing, snowboarding, snow tubing and ice skating as well as indoor activities such as water parks and spas. Spend the afternoon skiing or snow tubing, then unwind with a soothing massage. Finish the day with entertainment and fine dining for a perfect winter day surrounded by the beauty of the Finger Lakes. You’ll also find several ice skating centers as well as outdoor parks for ice skating surrounded by winter’s frosty beauty. While most people visit the region to fish during warm weather, the ice fishing in the Finger Lakes is exceptional. Fish for rainbow and lake trout and salmon on one of the many icy lakes in the region, then get cozy in one of our luxury rentals to take the chill off. There’s even a Free Fishing Weekend in February! At the end of each day of your winter visit to the Finger Lakes, retreat to one of our luxury houses in Skaneateles. 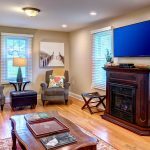 Each of our homes surrounds you with cozy comforts like crackling fireplaces, cable television and beautifully decorated bedrooms. Lodge homes situated on country acreage offer walks through winter wonderlands, stunning lakeside views and privacy. Discover the beauty and bounty of a Finger Lakes winter while relaxing in one of our Skaneateles luxury vacation rentals. You’ll quickly realize why so many people return again and again for winter in the Finger Lakes!